I've had solid training. I've had solid support. Things are coming together nicely. I hope all this holds the weekend of April 27-28 when really anything can happen at the C&O Canal 100 Mile Ultramarathon! The weather was a bit rough at the Little Rock Marathon in Arkansas but I had a great time and met several new people. That and more in this edition of the Running in the Center of the Universe podcast! Thanks for listening. Music by Garageband, U.S. Marine Band, and the late Derek Miller's Penmachine. I completed the 2nd annual Light to Light 50 Mile Ultramarathon in the Outer Banks of North Carolina on February 2, 2019. I finished the race but the course I ran was a little different than the other participants. I took a wrong turn and wasn't able to correct the situation before I was at the point of no return. This podcast has plenty of audio clips from the experience. You may agree or disagree with the way the race director handled my situation. I'm interested in your comments at ashlanddave@gmail.com. There are several things to consider when preparing for an ultramarathon, especially if the upcoming race is just a part of a longer effort to be attempted later. In this episode, I talk about the upcoming Light to Light 50 and how the race plays a role in my future attempt at 100 miles in April. Thanks for listening! I like to support whatever is trendy so here's my 'year end in review' podcast (another exercise of me talking for almost 30 minutes straight). This episode includes comments about two ultra movies on YouTube that I think are really cool, especially if you're like me and either considering a 100 mile race or have signed up for your first. My local weekly running group finished a project that we called the "Map Run." 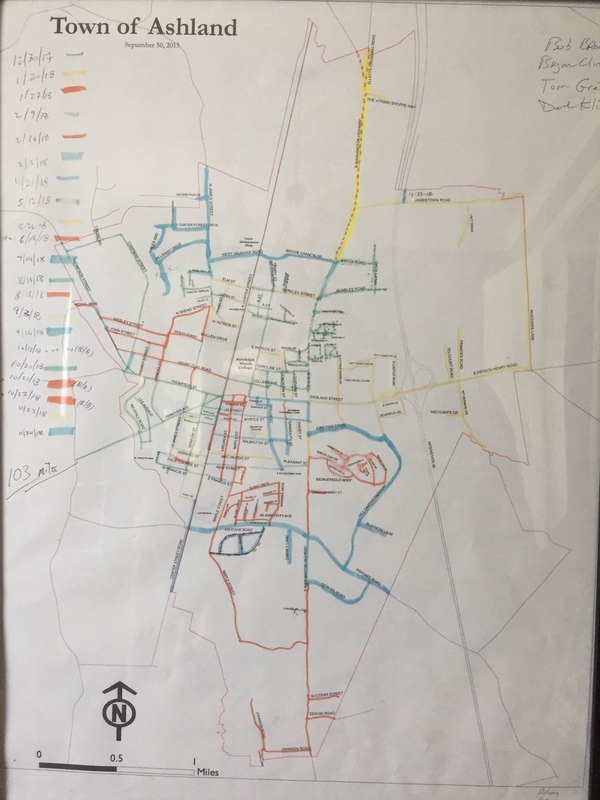 The project was to run all of the streets in our town. The distance amounted to about 103 miles. Covering the distance wasn't really the hard part. The hard part was to have all four of us show up to do the group runs! We had a great time doing the project and this show has some audio clips about the experience. My co-pacing partner for the Richmond Half Marathon and I had a great time and successfully finished just 4 seconds off the 2:30 pace. Avi has a lot of pacing experience and showed me the ropes. It was a great morning running in the City of Richmond! This show is about that and some funny things that happened along the way! I have the privilege of pacing the 2:30 half marathon group for the Richmond (Virginia) Marathon on November 10. This is the first time I've done this. This show has some commentary about that and other upcoming events. Thanks for listening! My long standing weekly running group has undergone a major change. Not a good thing but not really a bad thing either, just a significant change. In this episode, I talk about Ashland Byan moving from the Ashland area and how that may impact our weekly men's running group. Ashland Tom and I ran the 12th annual Patrick Henry Half Marathon on August 25, 2018. Tom has run all 12 events. I've done 11. It's a great course, literally "town and country." This show has some thoughts on the experience plus some audio clips from the race itself. Thanks for listening!